Nearly everyone may be affected by hives at one time or another in their lifetime. Hives are itchy and uncomfortable and develop very quickly. This condition is known medically as urticaria. This condition is a reaction to histamine, a substance secreted by cells called "mast cells" that are distributed throughout the body. The same thing essentially happens when a person bumps up against the tiny hairs covering the stinging nettle plant. Histamine produced by the body plays a role in bringing on the symptoms of hay fever-type allergies, including watery eyes and sneezing. This is why antihistamines (substances that block the natural action of histamines) can aid in treating so many allergy symptoms, including hives. 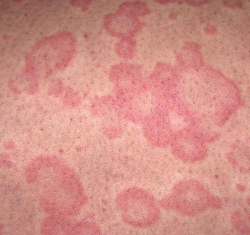 About 15 to 20 percent of all people will experience a case of hives at some time in their lives, but this happens more frequently when an individual is a young adult. While the causes of urticaria can be many and varied, it is important to discover the cause of the outbreak to avoid further problems in the future. Finding the exact cause ranges from very simple to extremely difficult. Foods - While any food can be the cause of hives, most frequently hives due to foods are caused by fish, seafood, nuts, chocolate, eggs, cheese, milk, tomatoes, strawberries and citrus fruits. Food additives - Coloring agents, preservatives, and flavorings can all cause urticaria. The flavoring agents in non-food items such as mouthwash, chewing gum and toothpaste can also be the culprits. Medications - Any medicine (whether prescription or not) can cause hives. Some of the most common offenders include aspirin and penicillin. Even items such as vitamins, birth control pills, eyedrops, laxatives or nasal sprays can be the cause of urticaria. Even a product someone has used before, or used for a long period of time without problems, can suddenly cause hives. Inhalants - Animal dander, pollens, chemical fumes and household dust can cause hives in certain individuals. Insect stings - Although an insect sting always causes a welt at the site of the sting, welts can break out all over the body if the person is allergic to the insect sting. Some allergic reactions to insect bites can be fatal. Those people who develop multiple welts or experience choking or wheezing need to seek immediate medical attention. A physician needs to treat this sting but also needs to help protect and/or desensitize the person against future stings. Infections and other internal problems - Hives can develop along with bacterial infections such as strep throat, an abscessed tooth, sinus infections, etc. Urticaria can also develop alongside colds, mononucelosis and other viral infections. Hives can also be provoked by internal diseases such as lupus erythematosis, malignancies and hepatitis. Unusual causes - Some individuals develop hives from such causes as heat, sun exposure, contact with cold or pressure on the skin. Those people who suffer from contact with cold objects or cold weather should be very cautious about swimming. If they were to plunge into very cold water a massive and immediate case of urticaria could ultimately lead to drowning. The most important aspect of prevention of hives is to find out what causes the condition. Once that has been accomplished, the person should avoid the cause. Once something sets off a case of hives, the next time the person is exposed to it, the same reaction will likely happen again. Be sure to avoid the trigger in the future. However, if a medication is to blame, be sure to consult a physician first to ensure a replacement medication can be taken. The day and time the hives developed. The day and time of exposure to likely causes of the urticaria, including all food and drinks, pills and medications, nosedrops, eyedrops, candy, toothpaste, chewing gum, and mouthwash. Try to find a pattern in the outbreaks. A repeated event or exposure is probably the cause of the urticaria. Any case of urticaria can be made worse by aspirin, or acetylsalicylic acid. Some people are allergic to aspirin itself. For those people, aspirin can give them urticaria or a more serious sensitivity reaction. The aspirin-like chemicals in certain foods or food additives can also cause this condition. For any cases of urticaria, avoid ALL ASPIRIN. Avoid foods with artificial coloring and flavors. Any foods and drinks with yellow coloring should be particularly avoided. People who are allergic to penicillin should be aware that this antibiotic can be present in any type of dairy product (this medication gets in by the cows being treated with penicillin). Such individuals should avoid milk, cream, cheese, ice cream and ice milk. Antihistamines have a fairly specific ability to ease the swelling and the itch to stop and/or control the urticaria. Chlorpheniramine maleate tablets (or 4 mg chlorpheniramine maleate syrup) are available as generics and under brand names. Continue to take the antihistamines for as long as is required to suppress the hives outbreak.